This is the pair of 2 in 1 socks I’ve been working on lately and as of this morning I just finished! 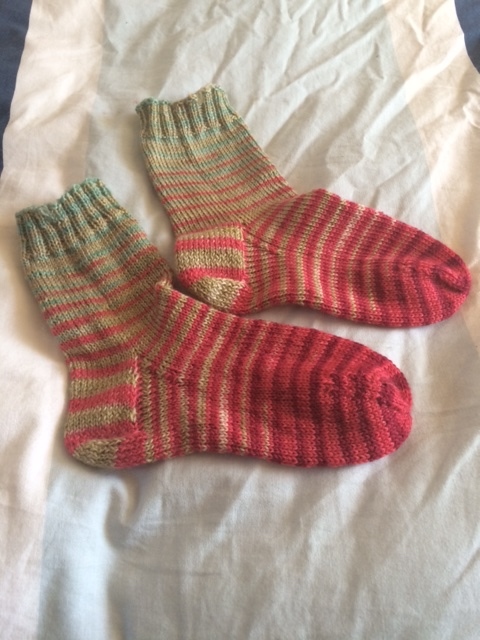 The yarn is gradient yarn from Knitcircus and this pair was actually knit using the rest of a skein that I had used to knit another pair of socks. So from this one skein, I actually got 2 pairs – one medium sized and the second in a child size for my youngest daughter. Would you believe that both pairs came from the same set of gradient striping skein? 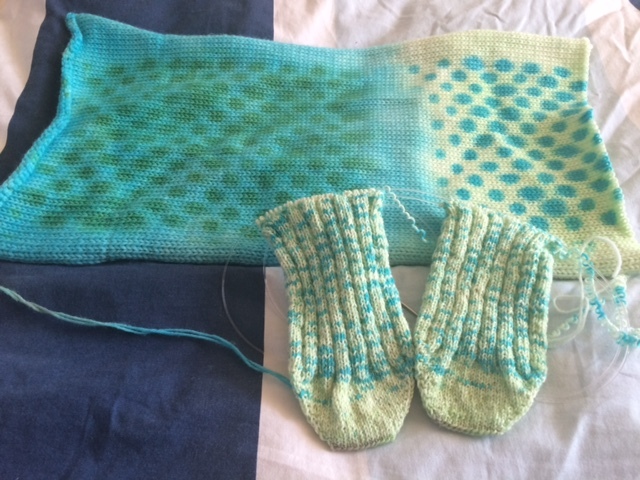 Also both pairs were knit using the 2 in 1 method I learned from a pattern by Kate Atherley. 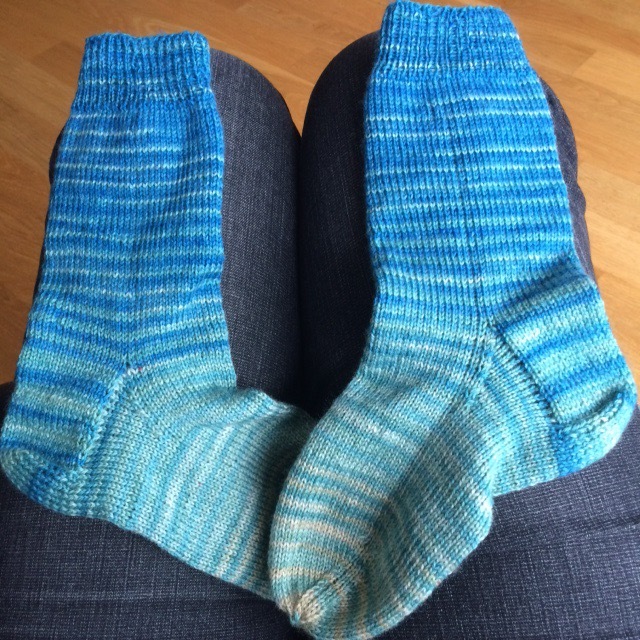 I must say that I have totally fallen for this method of sock knitting. What I need now is to discover how to use this and knit patterned socks, like with lace panels or something because so far, I’m only able to knit plain stockinette socks using this method and I’ve lately discovered a million gorgeous sock patterns online that I’d love to knit but am bothered because I can’t use the 2 in 1 method to do them! On that subject, I’m going to prepare a post soon about all those free and gorgeous sock patterns I’ve discovered lately and maybe you will see something you too will want to knit. 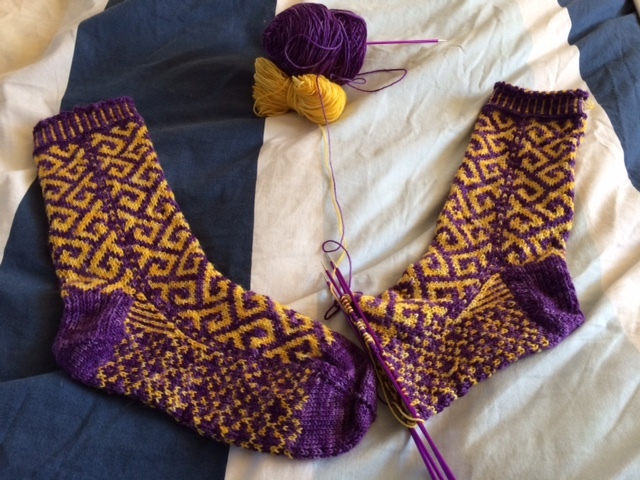 Then there’s my pair of Philosophers Walk socks by Lesley Melliship and I’d like to add that I sell kits for those online and will also offer kits at the I Knit Fandango show in London 15-16th of May 2015. 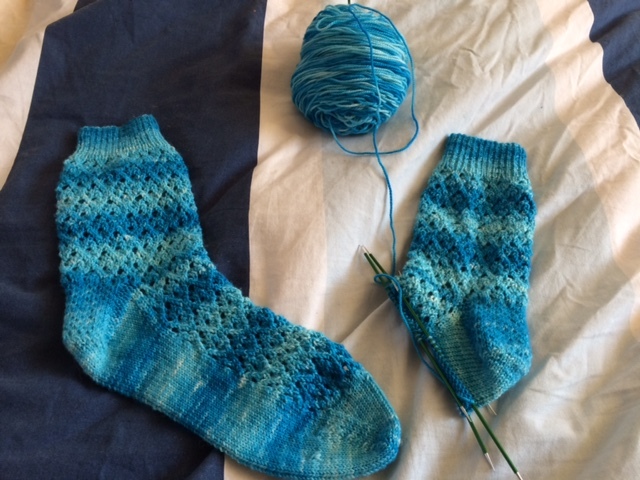 I’ve completed one sock and the second one is almost done so this really should become my priority now as I’d love to show them in London to show people that are interested in buying the kit. So here are mine I really love how purple and yellow go together. And then the last pair of socks that I have going at the moment, and I’m planning on writing a post on these later on, are socks knit from a sock blank. A sock blank is a piece of machine knit yarn that is either knit double or single and then you basically “unknit” it as you knit. No need to wind into a ball, you just get going immediately. This is also a fun medium to try with regards to handpainting yarn. This particular blank was a test on my part where I did 2 different colours and dots and the knitted result is rather fun. 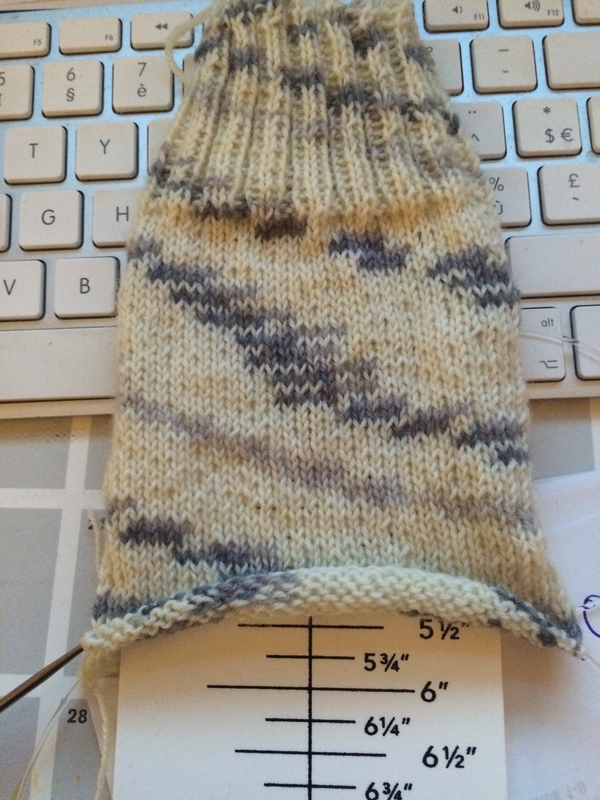 The pattern is just simple stockinette and ribbing. So, I’m still hooked on sock knitting as you can see. Now before I say goodbye for today, I want to let you know of an update in the shop. 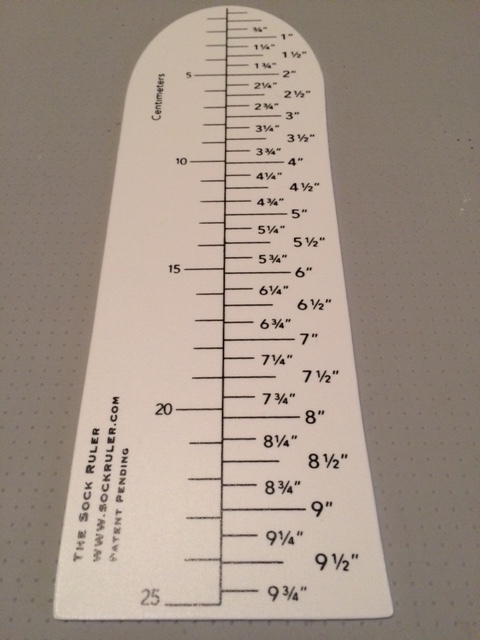 I just received the NEW version of the Sock Ruler – the new version has measurements both in inches and centimeters so no matter what pattern you want to knit, the Sock Ruler will be perfect! If you are not familiar with this new awesome tool, then let me explain. The Sock Ruler is a Ruler like the name indicates and you use it instead of a tape measure. It is made out of rigid plastic and has the shape of a sock on one end. It makes measuring the different parts of your sock a breeze as your sock can lay flat so it is way less fiddly than using a tape measure – not to mention I have not lost one Ruler so far where as my tape measures have a tendency to disappear into thin air making it necessary to have a gazillion on hand all over my project bags and house basically. This is what the new ruler looks like – On the left side you have the CM and on the right side the IN. « A Pin It – Win It contest – what do you think?